(Trent Nelson | The Salt Lake Tribune) Utah Jazz forward Joe Ingles (2) shoves Utah Jazz guard Donovan Mitchell (45), celebrating a turnover as the Utah Jazz host the Denver Nuggets, NBA basketball in Salt Lake City on Wednesday Jan. 23, 2019. Three thoughts on the Utah Jazz’s 114-108 win over the Denver Nuggets from Salt Lake Tribune beat writer Andy Larsen. Donovan Mitchell was incredible tonight, scoring 35 points (12-25 FG, 6-10 from 3), adding six rebounds, six assists, two steals, and two blocks. And the Jazz needed every bit of it. In the 38:23 he was on the court, the Jazz outscored the Nuggets by 21, in the 9:37 he was off it, the Jazz were outscored by 15. It’s also the first time a Jazz player has scored 35 points in consecutive games since Karl Malone did it in 1998. How’s that for good company? Obviously, the 3-point shot falling is very good for Mitchell. He’s now shooting 42 percent from deep in January, and obviously, 6-10 is an excellent performance. Or you can pass find the open man in the rotations that follow. This was the play that Mitchell said was his favorite of the game. His defense was critical in this game as well, as when he blocked Torrey Craig’s point-blank opportunity by helping off his man down low. Mitchell has developed a really good sense of that, when to help and when not to. In his rookie season, he was too eager to make a play, but that’s a good example of a good time to help: when the alternative is a layup, when the offensive player’s back is to you and a pass out is unlikely. It’s sometimes tough to remember what Mitchell was supposed to be as a prospect, but one of his top comparisons was Avery Bradley, a guy who was a defense-first player and could do some things on offense, but not carry the load. Mitchell obviously hasn’t been that — and actually, neither has Bradley, who has been bad this season — but he is an elite defensive prospect as well. He’s been getting the opportunity to show it off recently. After the game, some of Favors' teammates thought that the ejection was a little unfair, for what he considered was a retaliatory push. 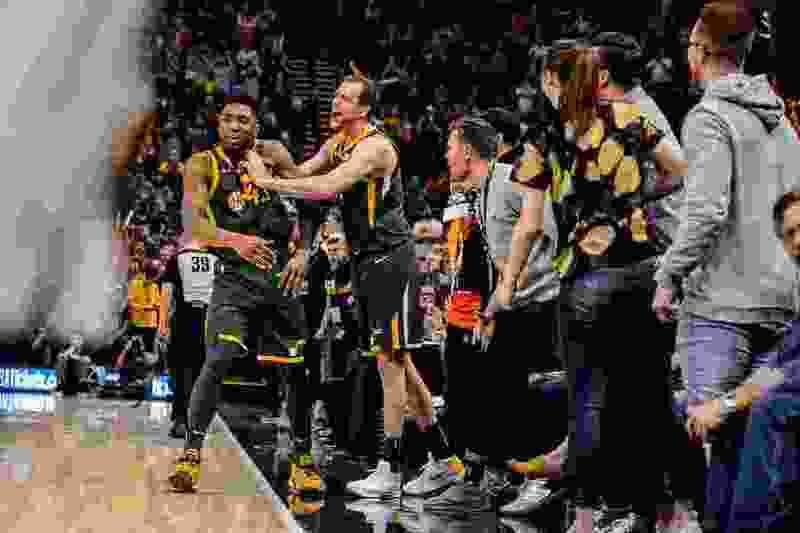 But regardless, the scuffle meant that the Jazz had to rely on a bench of Grayson Allen, Royce O’Neale, Kyle Korver, Jae Crowder, Georges Niang, and Ekpe Udoh. And that bench struggled, letting the Nuggets back into the game twice. Those lineups seem to struggle on both ends. Jazz head coach Quin Snyder does a good job of staggering minutes, but with the injuries compounded by ejections, it’s hard to keep a high level of talent in the game for all 48 minutes. Usually, the Jazz have problems scoring with only one ballhandler on the floor at any given time, and the Jazz rely a pretty big amount on Favors getting cheap offensive rebound putback points. They also struggled defensively tonight, staying in front of Denver’s very quick and capable scoring guards. The return of Dante Exum fixes some of this, as he can get cheap points too through his skill in transition and with his first step to the rim. He’s also a long and versatile defender, as is Thabo Sefolosha, also out. But it’s something to consider when you’re crafting trades over the next two weeks: if you’re including Favors as salary ballast, what do the Jazz’s bench minutes look like? It would have to be a sizable upgrade to the starting unit to make that deal worth it. Potential deals like that might exist, to be sure, but given Favors' productivity this season, the returning piece or pieces have to be pretty enticing. Here’s the secret to this play: Mitchell asked for the fans' help. You can see, he actually is telling the fans to yell and shout and clap in Will Barton’s ear as he inbounds the ball, and they stand up and oblige. After the turnover, Mitchell celebrates and then gave the fans a high-five for their trouble. I love this. These are front-few-rows fans, generally the hoity-toity type, getting involved in the game by responding to the request of their team’s star. Fans so often think they make a difference: think of the superstitious guy who has to maintain one seat position, or wear one by-now-far-too-dirty item of clothing throughout a game because one time the Jazz did something good. But here, they actually did, just by making noise. It’s not going too far, it’s not rudely heckling, it’s not violating the NBA’s code of conduct, it’s just being a good crowd. It’s great to see.